Flicking through a copy of the Evening Ipswich Star, trying to figure out why my mum had left a copy in the porch, I chanced across mention of a new eatery "to open in February". How terribly serendipitous, and I'm not even going to spell check that word. Most days I cycle past the medium-sized Tesco in the beating heart of Grange Farm in deepest darkest Kesgrave. Yonks back, it had its own caff, that area long since given over to DVDs, fags and mags. 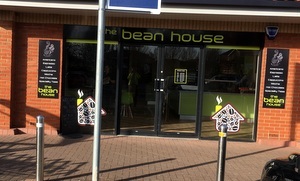 Now, along from the beauty salon and the dry-cleaners in the romantically named Unit 1 is The Bean House. Oddly, Andy talked of establishing such an establishment around these parts way back when since, as it true today, there's precious little competition and plenty of people with a quid or two. Spartan decor at present and no pics, just coconut halves on the wall. Seriously. We hit it at peaky blinders time and struggle for a seat. Where were all these folk previously getting their jolts? Refrigerated unit has Coffeelink style pre-wrapped sarnies, wraps and paninis. Most satisfactory honey 'n' chilli for me, ditto Kev's piri-piri, while trad Andy, man of the people, opts for the straight-up fresh bacon bap. In a nod to Parks & Recreation, I choose the threateningly titled "kale kick" smoothie with pineapple and spinach. Much better than you'd think, as something should be when it accounts for about seven of your five-a-day. Let's pass over the questionable newspapers on offer and instead take note of the smiling staff and the free WiFi, nearly but not quite standard these days. Tables freeing up as we share a decent tiramisu slice and cappuccino cake with an equally fine flat white. Ten minutes bike ride from work, I'll be back here in the summer. If it was a car -- BMC Mini.